Click on the image to zoom in on the detail of the NHA seal. In 1659, Thomas Mayhew, a Puritan leader, purchased a portion of Nantucket directly from the Native American Indians who inhabited the island. Mayhew, in turn, sold the island to a group of nine English settlers from Massachusetts and New Hampshire who wanted to develop their own community outside the boundaries of Puritan control. Among the buyers were Thomas Macy, Mayhew’s cousin, and Tristram Coffin, father of the Coffin family in America. This group of families became the “original proprietors” of Nantucket. Mayhew’s compensation for the land — thirty pounds sterling and two beaver hats — is symbolically recorded in the seal of the Nantucket Historical Association, drawn in 1894. Thirty coins are depicted along with two hats. Also on the seal are a crossed arrow and harpoon, recognizing the island’s history as both a hunting ground and a whaling center. 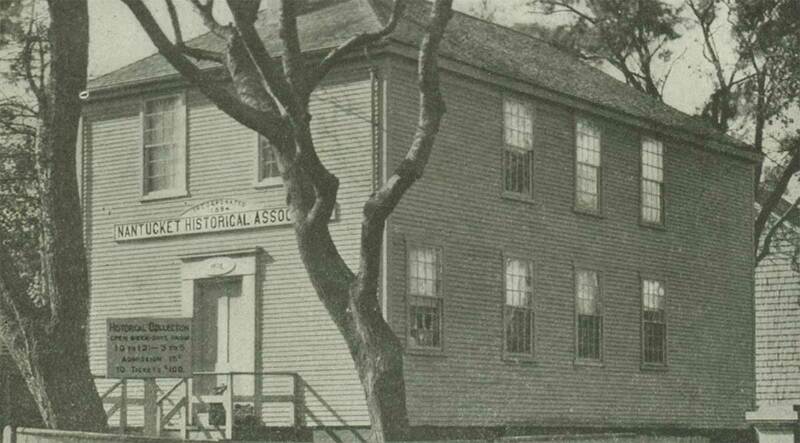 1894, Nantucket Historical Association established; purchases Quaker Meeting House. 1904, the Fair Street Museum built. In 1927, seasonal resident Edward F. Sanderson turned over to the NHA a collection of whaling implements—“harpoons, lances, spades, figure-heads, ship-models, scrimshaw, rare old whaling prints and books”—that he had been gathering since 1925 specifically to equip a whaling museum on Nantucket. He also facilitated the society’s acquisition of the Hadwen & Barney Candle House on Broad Street, which opened as the Whaling Museum in 1930. Opened to the public in 1930, the Whaling Museum is the NHA’s flagship, attracting over 90,000 visitors each year. Sanderson’s collection of whaling gear made up the bulk of the exhibit in Sanderson Hall, where lectures on whaling history were presented during the summer. Significant collections of scrimshaw, marine paintings and ship portraits, South Seas ethnographic material, the skeleton of a forty-three-foot finback whale that washed up on the north shore in 1967, and the original Fresnel lens from the Sankaty Lighthouse provide visitors with an insight into Nantucket’s whaling history. 1946, the Town of Nantucket deeded the Old Gaol and adjacent House of Corrections to the NHA. 1951, 1800 House donated to the NHA by Louise Melhado, owner of neighboring Moors End. 1959, Folger-Franklin Memorial Boulder and Bench donated by Thomas Hallowell. her parents, William Macy Bartlett and Lizzie A. Nash Bartlett. 1963, Hadwen House donated to the NHA by Jean Satler Williams as a memorial to the Satler family. 1968, The Old Town Building, 2 Union Street acquired. 1971, The Peter Foulger Museum opened. 1971, Macy-Christian House bequeathed to the NHA by Ruth Christian. 1972, Greater Light bequeathed to the NHA by Hanna Monaghan. 1978, Eleanor Ham Pony Field bequeathed to the NHA by Eleanor Ham. 1980, Thomas Macy Warehouse acquired. 1986, NHA Museum Shop built. 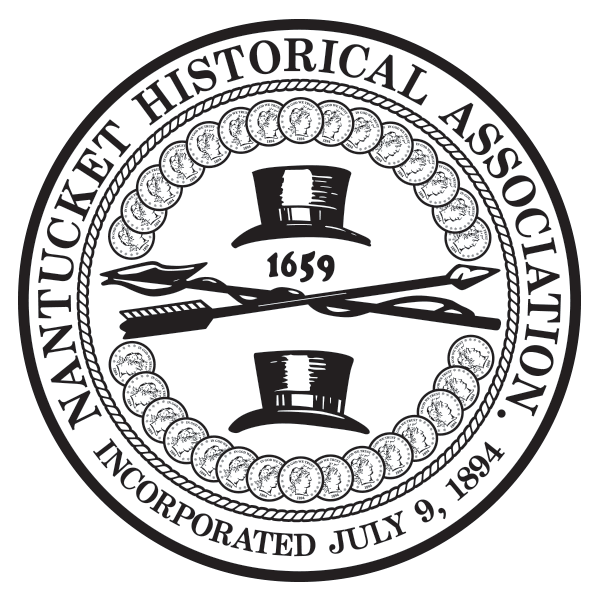 In 1987, a group of residents with a keen interest in the NHA and its collections formed the Friends of the Nantucket Historical Association. 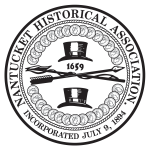 The purpose of the organization is to raise funds that are specifically for purchasing important artifacts relating to Nantucket history. Such items add immeasurably to the depth and breadth of the NHA’s collections. The impact of the Friends group is remarkable. Because of their efforts a great number of important artworks and artifacts have either been kept on Nantucket or have been returned to the island. 1987, Oldest House damaged by lightning. Reopens in 1990. 1987, Thomas Macy House, bequeathed to the NHA by Oswald Tupancy. 1994, Bartholomew Gosnold Center built as storage facility for the NHA’s extensive artifact collections. 1997, Sperm whale skeleton acquired. When a forty-ton sperm whale died on Low Beach on New Year’s Eve 1997, there was an immediate popular surge of enthusiasm to keep the creature’s skeleton on island and add it to the Nantucket Whaling Museum. After a team of scientists completed a necropsy of the whale, a volunteer team from the community—led by fishermen, excavators, and staff from the historical association—undertook the noisome and filthy process of dissecting the animal and preserving its bones. The federal government granted permission for the Whaling Museum to keep the skeleton by the end of January 1998, and this step led to renewed efforts within the historical association to plan and fund a major reconstruction of the aging Whaling Museum in order to place the skeleton on public view. It took a number of years for the bones to be cleaned, leached of their oil, and prepared for exhibition, and even longer to rebuild the museum, but the new museum opened in 2005 with the skeleton of the whale as its dramatic centerpiece. 2001, After a year-long renovation, the Fair Street Museum reopened as the Research Library, which houses the association’s library and archival collections. 2005, newly renovated and expanded Whaling Museum opens. 2018, 4 Whalers Lane acquired for future expansion.